Disable Jetpack Comments on specific pages in a WordPress site? » Pacosoft | Website Design SEO software development Ottawa and Des Moines. Disable Jetpack Comments on specific pages in a WordPress site? 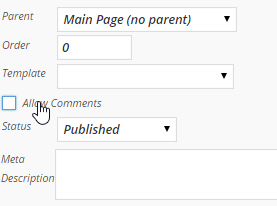 If you are building a pure WordPress blog site, then you can keep the default behaviour of inserting the Jetpack comment (or any other comments plugin for that matter) on each page/post, etc. But for a corporate site or any site where the blog itself is just part of the whole system, you will quickly find it expedient to hide the comment feature on specific pages. From the WordPress dashboard, go to Pages>all pages. hover over the page you want to change and select “Quick Edit“. Somewhere On the right side, there is check box that says “allow Comments“. Just un-check that to disable the Jetpack comments or any other WordPress comment plugin on the current page. Copyright © 2003-2019 Pacosoft LLC. All Rights Reserved.